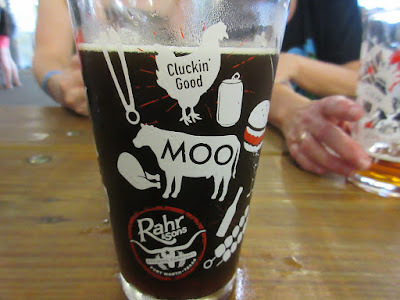 The Mrs and I headed over to the Rahr and Sons brewery in Fort Worth. My Mrs loves the beer, but I went mainly for the band. 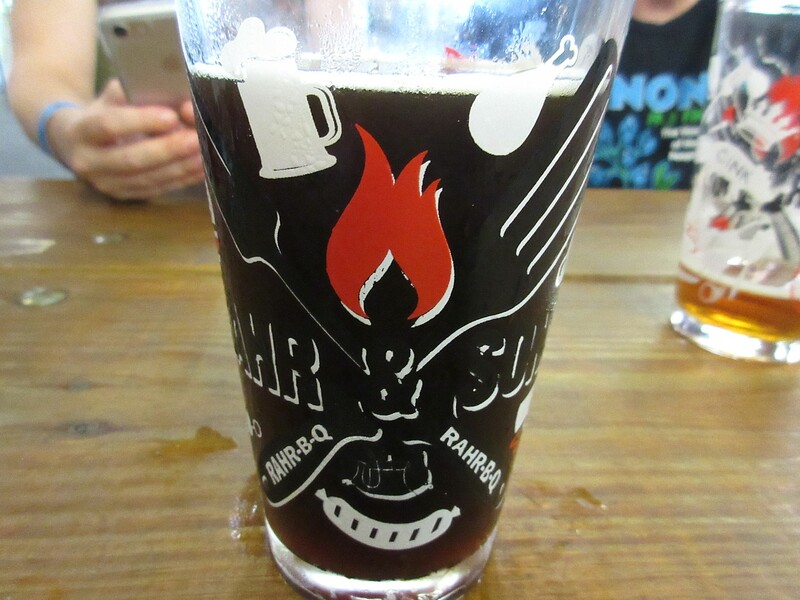 Unbeknownst to us it was Rahr-B-Q day at the brewery and admission included a special BBQ themed pint glass. 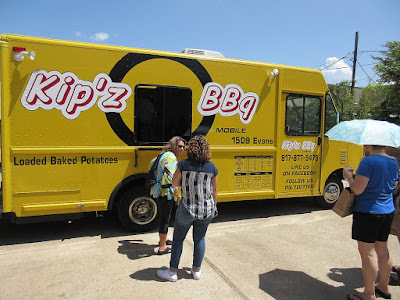 They also had a BBQ food truck on hand and I was surprised at how good it was. 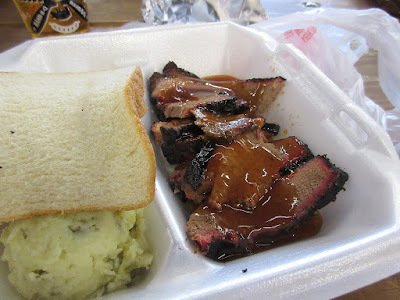 The brisket had nice smoke flavor, was tender and moist, and the fat was nicely rendered. My Mrs grabbed the Q and she is not yet trained to get the sauce on the side, but I found enough good slices unsauced to get a good sample. 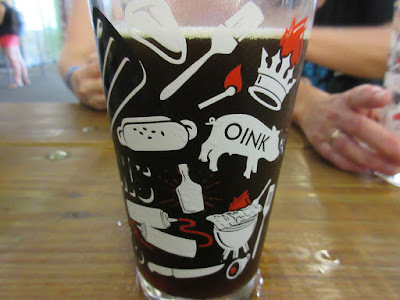 I definitely need to make an expedition to that food truck on another day when I'm not so sloshed on Brown Ale. My Mrs found ribs at a decent price, $1.49/lb, so we decided it was rib time. We've seen them cheaper, but these were pre-trimmed so there was little prep work required. 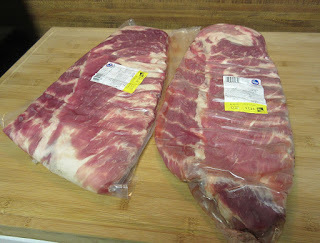 As always, we had to cut the racks in half so they'd fit on our little bullet smoker. 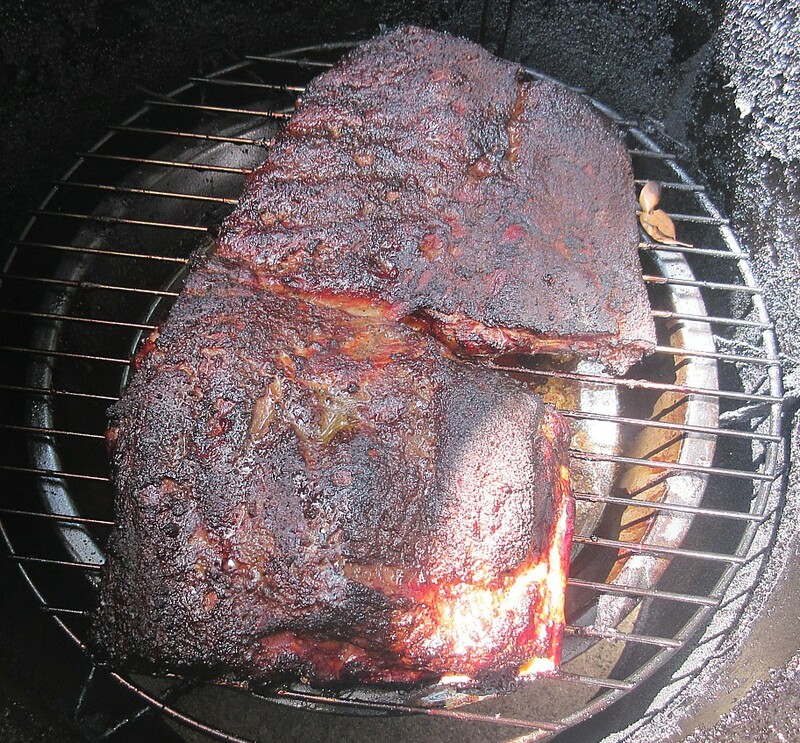 A good coat of North Main All N 1 rub and we were ready to go. 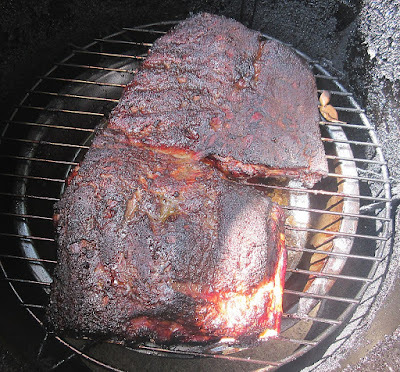 After 4 hours in the bullet here's the top rack. 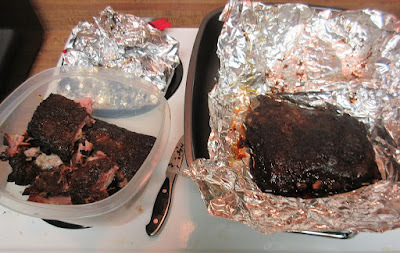 The little bits were some meat saved from the trimming. They made a tasty crunchy snack. We took them in and slathered them down with Dr Pepper BBQ sauce, wrapped in foil, and into the oven for one more hour at 250. 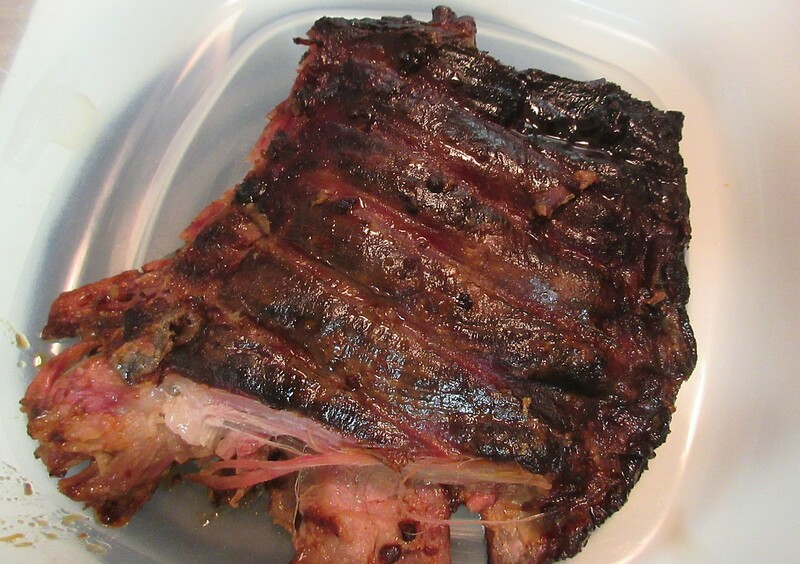 After an hour we had some pretty nice ribs. 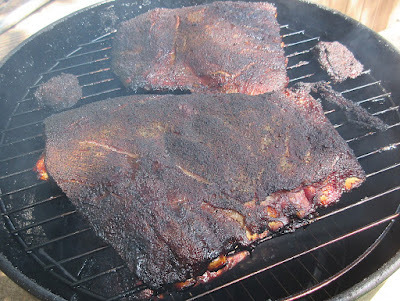 Moisture and tenderness were good, smoke flavor was good, and the taste was excellent. 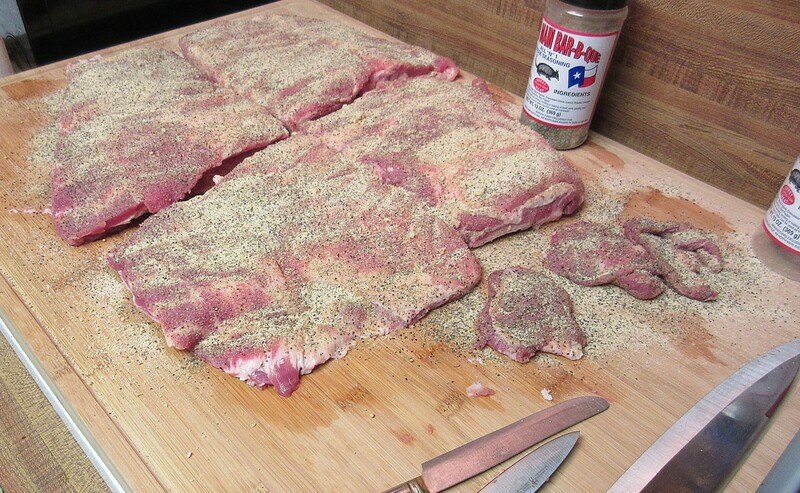 The sweet of the sauce offsets the saltiness from the rub just perfectly. After having our fill, the rest went onto the fridge to warm up later this week.